There a million ways this movie could have gone belly-up, like almost every other TV adaptation. Thankfully, Get Smart avoids all of the problems that usually make TV adaptations unbearable. Casting is spot on across the board, the jokes hit hard throughout, and most importantly, the film remains faithful to its television roots. Now, by faithful, I don’t mean that this is a carbon copy of the TV Show. There are plenty of differences in characterization and back story, and everything is updated for modern times. However, there is a method to this apparent madness, and everything is as it should be. For example: When the film opens, we see Maxwell Smart (Steve Carell) on his way to work; he enters the Smithsonian, where a tour group is being educated about the former government agency, CONTROL (the exhibit includes the classic Sunbeam car and shoe-phone). But Smart knows otherwise, and enters through a secret passage into a long series of security doors, ending in a room with a phone booth that takes Smart down to the headquarters of CONTROL. As you can see, this sequence isn’t exactly what one might see in the TV show, but in those first few minutes, you get plenty of references to the show. As Smart walks through the long row of security doors, the theme song to the TV show plays in fully orchestrated glory. It’s a darn good start, and it only gets better from there. The film isn’t a remake of the TV show; it’s a re-imagining with references to the show flying at you every minute or so. I’m not too familiar with the show, but my father is, and he was recognizing various in-jokes every few minutes. It speaks volumes that someone who isn’t familiar with the show and someone who is can enjoy Get Smart on an equal level. 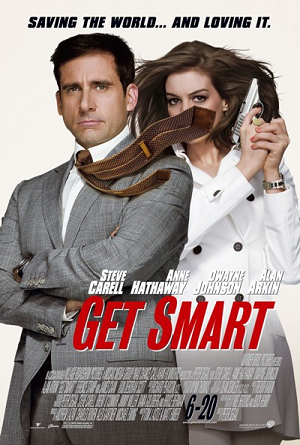 Steve Carell takes on the titular role of Maxwell Smart, an analyst for CONTROL who becomes a field agent when KAOS obtains records of all the field agent’s names and faces. He is partnered with the more experienced Agent 99 (Anne Hathaway) to stop KAOS from obtaining and detonating nuclear weapons. The plot is classic Get Smart; that is to say, James Bond meets Mel Brooks. The plot opens itself up for plenty of humor and action, which technically means this film is defined as an Action-Comedy. The Action-Comedy genre is a curious one; the term implies equal measures action and comedy, but I’ve never really seen a movie that lives up to that promise. The most popular modern example of an Action-Comedy is probably the Rush Hour franchise, and those lean more towards action than comedy. Get Smart is remarkable in the way it leans neither one way or the other. After seeing the film, I debated with myself whether the action stemmed from the comedy or the comedy stemmed from the action. The answer is that both of those statements are true, meaning the film captures action and comedy in equal balance. Are the action and the comedy both quality material? Definitely. The film will have you rolling on the floor one moment, and have you on the edge of your seat the next. The transition is flawless, and makes for terrific summer entertainment. Jokes ring true because of the sincere and excellent performances, combined with great writing and characterization. Steve Carell is perfectly cast as Max Smart. Did anyone think he wasn’t? Carell is famous as an inept goofball due to his portrayal of Michael Scott on The Office, and while this may sound strange, Maxwell Smart is a bit of a different character for him. Smart is not a complete goofball. In fact, he’s quite good at his job; he’s fluent in Russian, has a darn near photographic memory, and is good under pressure. His moments of being a bumbler come from being a rookie, not from being a moron. Carell doesn’t play the character like he’s in a parody; Smart feels like a real person. He’s a good guy and that is apparent on screen, which makes him very easy to root for. Anne Hathaway is just as good in her portrayal of Agent 99. She and Carell have terrific on-screen chemistry; the only on-screen pairing of this quality I’ve seen all summer would be Robert Downey Jr. and Gwyneth Paltrow in Iron Man, but they didn’t have as much screen time together. Anyway, Hathaway is one of the best 20-something actresses out there, and she’s really in top form here. Dwayne Johnson (formally known as “The Rock”) simply rocks (pun intended) as Agent 23, the suave super-agent whom Max idolizes. Alan Arkin often steals the show as The Chief, and actually gets the best line of the movie in a scene involving a swordfish and car crash. Terence Stamp (“Kneel before Zod!”) is an effective villain as Siegfried. The cast is terrific across the board, and it’s their interactions that often result in the best humor. There’s a healthy amount of physical comedy mixed with plenty of clever lines and references to the TV show that even those who aren’t familiar with the show might recognize (“Ah, the old ‘something something’ trick); these moments bring some of the biggest laughs. As I said earlier, the laughter is mixed with equal amounts action, and the action is excellent. The first great set piece takes place in mid-air. The absurdity of it brings plenty of laughs, and the quality of the scene showers us with thrills. There are plenty of other great set pieces, including the climactic one which takes place on planes, trains and (you guessed it) automobiles. Director Peter Segal has tackled some great comedies, but never a film with so much action. He could make a great career for himself as an action director, as evidenced by his work on Get Smart. The best part is that the action is never too serious; while we’re being thrilled, Carell and his co-stars still make us laugh. Get Smart is easily one of the most entertaining films of the summer; for entertainment value, it’s up there with Iron Man, Speed Racer, Indiana Jones or Incredible Hulk. This is one of those movies that will leave you with a big grin; a grin which will take a long time to fade. In the summer movie season, we crave action and comedy, and Get Smart tackles both of those birds with one stone, making the ticket price feel like a bargain. There are plenty of things I could nitpick about this film; it’s not perfect, but no movie is, and in the summer season, those little nitpicky things don’t really matter. We want entertainment, and Get Smart delivers in a big way, without insulting our intelligence. Of course, with a title like Get Smart, who would expect it to?